Hey shopaholics! Black Friday- one of the biggest shopping days of whole year, is approaching fast and if you want to check your total Christmas list off in a night read on. People can get a little bit crazy while shopping, but with plans and preparations in mind it might be fun and profitable. 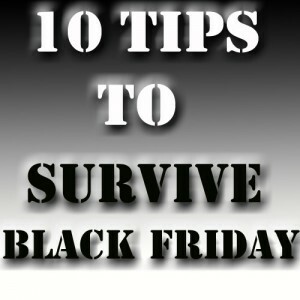 In this post I present you my top 10 tips to survive Black Friday. 1. Create a list! – Note down everything you have to buy and the possible budget you may spend on each gift. In this way you can be safe that you are not going to spend more money that you have planned. 2. Create a plan! – First you need to find out what the stores offer and where you can get more things for your bucks. Choose to visit the stores that have 3 or more things from your list instead of going to stores that have only 1 item. 3. Do a research! -Don’t watch only the adds on the TV because the cheap prices don’t necessarily make the goods a good business. Check up on the offers online, compare them to the TV sales and see whether they offer something better. Also don’t forget to check the warranty that comes with the goods. 4. Find a company! – Ask some of your friends to come help you with the shopping. Assign them with the stores they need to visit and the items they need to get. That’s the way you increases the chances to get the hot deals. 5. Start you engines! – Make sure you check out when the stores open. Some of them may open at Midnight, while others can stay closed till 4 in the morning. 6. Pull cash! – Shop only with cash during Black Friday. You will always know how much money you have left and you won’t crack your budget. 7. Pack up some snacks! – Pack up water to keep you hydrated and some snacks in case you get hungry. Remember that the lines will be extra long. 8. Wear comfortable clothes! – The best thing you can do is to get dresses in layers, because some of the stores will let you wait inside but others won’t. Black Friday is not the occasion to get all dressed up. It’s the time when you get dresses according to the weather. Don’t forget to put on some comfortable shoes. 9. Carry bags with you! – Some stores run out of bags, so make sure you get reusable bags with you. You can even get a rucksack, so your hands will remain free for more shopping. 10. Take some rest! – Stay at home the night before Black Friday and sleep through it. Don’t go partying, have a shower and just sleep. A rested shopper is a smarter shopper.